Messi was largely a peripheral figure in the game. MEMBERS OF ARGENTINA star Lionel Messi’s family were attacked by Chile fans during the first half of the Copa America final between the two sides on Saturday evening. The incident occurred just before half-time when supporters of La Roja began to insult the Barcelona forward’s family. The 28-year-old’s brother Rodrigo was hit by one fan after an angry exchange and the whole family were moved to a television cabin at half-time for their own safety. The family of striker Sergio Aguero were also insulted by a sector of the Chilean fans. Messi, meanwhile, was handed some rough treatment by the rival defenders at the Estadio Nacional and was struck in the chest by a violent kick from defender Gary Medel in the first half. The game finished 0-0 after 120 minutes of football and Arsenal’s Alexis Sanchez scored the decisive penalty to hand the hosts their first ever victory in the competition. Email “Messi's family attacked as Argentina lose the Copa America final”. 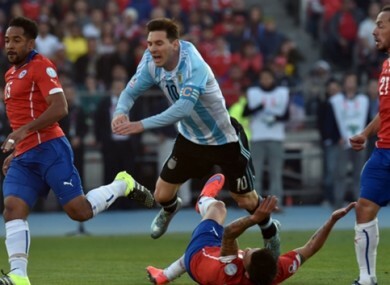 Feedback on “Messi's family attacked as Argentina lose the Copa America final”.